ABC News Bans Flag Lapel Pins? - Truth or Fiction? Rumors that the network has banned American flag pins have been swirling ever since the terrorist attacks of September 11, 2001. 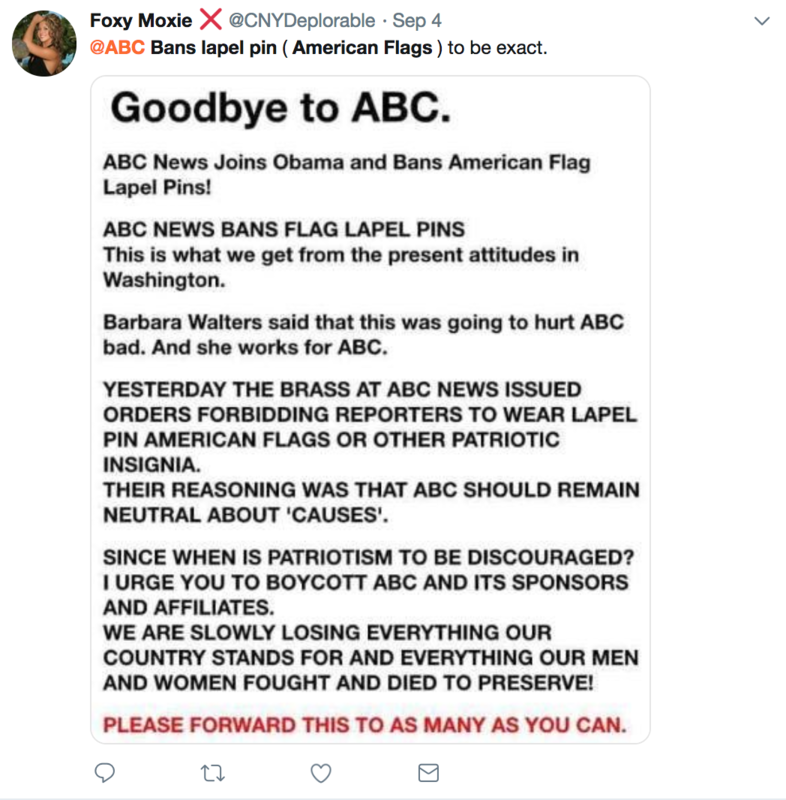 Executives at ABC News told reporters and anchors specifically to not wear American flag lapel pins on the air because the network should remain as neutral as possible. After the events of the September 11th, 2001 terror attacks shocked the nation, rumors immediately began to fly. One enduring story, that ABC News had banned American flag lapel pins so that reporters appeared “unbiased,” has been swirling ever since. They usually come as “proof” that the network is un-American or unpatriotic. The claim was based very loosely in truth at one point, but since then it has drifted more toward complete fiction. 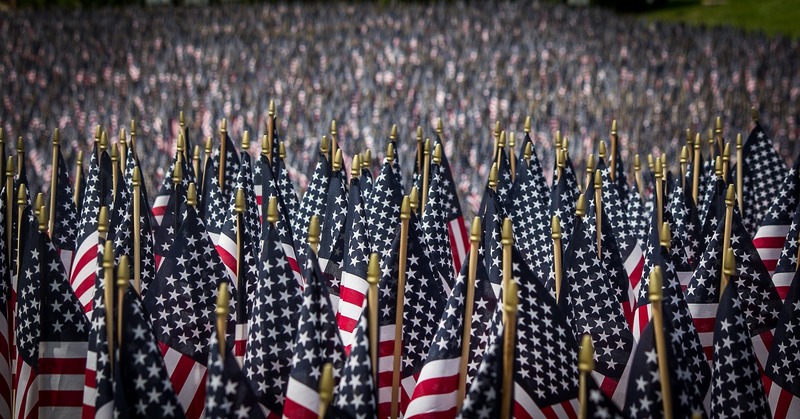 The September 11th attacks sparked a wave of fear, patriotism, and jingoism that had not been seen in decades — fertile soil for gossip and hearsay to take hold instead of fact. As a result of the patriotic fervor, though, some television reporters and personalities elected to wear American flag lapel pins on the air. Many media outlets struggled to preserve a “neutral” image, while at the same time being accused of appearing “unpatriotic” during a time of unprecedented American crisis. The debate began filtering through to an already strained public, creating difficulties in particular for television anchors and reporters trying to avoid personal partisan displays. As the Orlando Sentinel reported, CBS, NBC, and CNN did not have a lapel pin policy in place at any point before or after the September 11th attacks, and reporters for those stations regularly wore American flag lapel pins on-camera while covering them. When word got out that ABC had “banned” American flag lapel pins, the network became a lightning rod for criticism. However, that criticism was misguided from the first. The network never specifically singled out American flag lapel pins — it prohibited its reporters from wearing any lapel pin on the air. It came up while I was in the control room. As you’ll recall, we were on the air for about four and a half days straight — 24 hours, seven days a week with no commercial interruption or anything else. There was constant reporting coming in during that time and we were having to make decisions about what to do and what not to do…. They came to us and said, “We are being asked why we’re not wearing lapel pins,” because a number of other outlets, particularly cable news, were. Fox News in particular had integrated the American flag into the backdrop and bumpers and teases and everything else. And we’d long had a policy at ABC News that we wouldn’t let people wear any lapel pins of any sort. The theory being that when you’re reporting the news, you should be reporting the news, not taking a position. I said quickly, “We’re going to stick with our policy and stand by that.” I believe to this day that was the right decision. Ever since, the stance that ABC News takes on all lapel pins — including American flag lapel pins — has been widely misunderstood. Under the policy, reporters are simply asked not to wear lapel pins. What happens if they do anyway? Not much, apparently. Terry Moran, who covered the Bush administration in 2001, chose to defy the network and wear a flag lapel pin. He still climbed the network’s ranks over the next decade and became co-anchor of the show Nightline. Needless to say, this rumor remains false. CNN. "In The Trenches at ABC." Cox News Service/The Orlando Sentinel. "Flag Pins Spark Debate In TV News." Cruz, Gilbert. "A Brief History of the Flag Lapel Pin." Are Fetal Cells Ingredients in Food and Drinks? Walmart Closes 5 Stores Because of Plumbing Issues, Speculation Ensues-Truth! & Unproven! Do Mobile Phones and Other 4G Devices Contain an ‘E911 Chip’?